Hey everyone. Recently was replacing the engine shocks on my 300sdl. The strain from the new shocks actually doing there job unlike the old worn ones caused my engine shock mount rubber that was dry rotted to pull out and seperate completely from the mount. Was stunned by the 275 dollar per mount price tag. Finally got a suggestion from a fellow member (thank you diesel911) to use a pourable mouldable urethane resin called flexane or devcon. Looked into it more and decided on the flexane 80. There are different numbers with 94 being the highest and least flex down to something like 64 with a lot of flex. I bought the smallest kit available which was the flexane 80 pourable one pound kit. Cost about 65 dollars and have a ton left over. Here is the process i took. This mount looks like new and works exactly like a new almost 300 dollar mount. For $65 investment and that will fix both sides with tons of the kit left i am very happy. 1. Removed the engine shock mount from vehicle. 3. Once down to bare metal and no rubber left i cleaned metal with degreaser and brake clean. 4. Used digital scales to measure out the mixture of resin and hardener. Ratio is 77-23 or about 4:1. I used only 1 ounce resin to about .25 ounce Jet for one side or 2 ounce to half ounce for both sides. 5. Mixed for around 3 minutes and pour the urethane into the metal mount. 6. Used a hair dryer on low to blow on the resin for about 10 minutes to bring all air pockets to surface and out of the mould. 8. Used a drill press to drill hole for the shock to come thru the mount. 9. Installed back on mercedes. This was a very simple process and with only 70 total in materials for 2 mounts versus the around $550 for both sides to buy the mounts i am more than pleased. This resin is actually made for this type use and works very well. I did some research and found people making engine mounts for 1000 horsepower cars, making old impossible to find rubber mounts, etc. I hope this helps some people out and maybe save some hard earned cash to put towards other maintenance on these lovely machines. 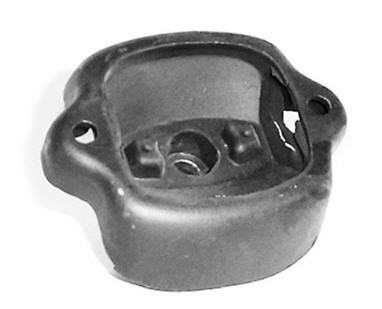 Where do you get the engine mount price tag for $275? A quick search for the same mount part # 1232413013 is $16. The cheapest one is $8.36. I would not go that route unless we are talking about different entities. That is an engine mount not an engine shock mount. Hugr difference. Do aquick search and u will see what i am talking about. 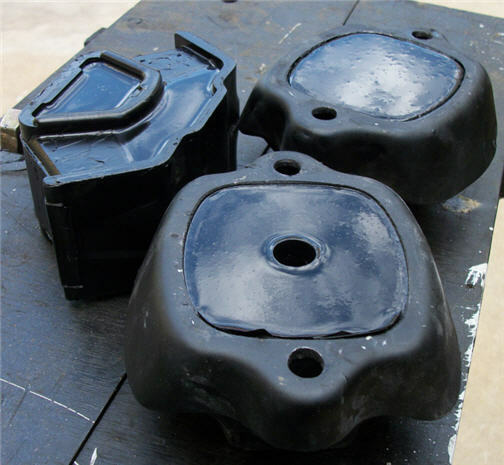 I used urethane in my motor mounts. These are for my engine swap project (OM617 into a 380SL) I used a new set of the fairly inexpensive new mounts and then poured urethane to support and prevent collapsing and separating of the mounts over time. This was mainly for the additional engine weight and because I was a bit tight on subframe clearance and this is my insurance. These mounts were subsequently drilled out to provide for the mounting bolts. Here's a stock "unfilled" motor mount for comparison. I can see where urethane might be a solution as you've used it for the engine shocks too. There are lots of uses for urethane and it is extremely easy to use and relatively inexpensive. What is the part #? They must be gold plated to cost that much. Wow, I do not expect a small engine shock mount to be so expensive. I am pleased that you can improvise with resin to fabricate one. May be I try to grab one if I see a SDL in the JY. It is also possible to cross check with different cars to see they use the same part and pull it from JY also. The part does not look particular difficult to manufacture to me. Why it is so expensive is beyond me. Last edited by ah-kay; 03-16-2012 at 12:36 PM. That's the product I used for my motor mounts. They're located here in San Diego, so I was able to just drop by the warehouse and pick up what I needed. They also carry epoxy which I've used on fiberglass projects in the past. The belt shock on 606 engines usually fail from the lower rubber bushing giving away but the shock remains perfect, This looks like a good remedy for that problem too. 4. Used digital scales to measure out the mixture of resin and hardener. Ratio is 77-23 or about 4:1. I used only 1 ounce resin to about .25 ounce hardener for one side or 2 ounce to half ounce for both sides. 7. Let it set for at least 12 hours. Recommends 24 on box but at 12 it seemed well hard enough to drill. I am glad it all worked out for you! I was a little bit worried about suggesting a Product that I had no experience with. But, as you said the other internet sites gave a good idea as to what the Flexane (made by Devcon) could be used for.